Kauai 2013 – Multi-faceted EKK Brings Joy to Many. Multi-faceted EKK Brings Joy to Many. When I was booking travel for the Lindsey father and son team known as Mele’uhane, Keikilani informed me that they did not have any frequent flier number because they rarely leave the island of Hawai’i. Coming for EKK was going to be only their second visit to Kaua’i. Making up for loss time or making the most of the opportunity, this man of action not only agreed to do his musical presentation at EKK with his son Leo, he also requested adding his Kumu Keoni Atkinson to the program and Keoni in turn brought his youngest daughter who was a bright gem with her beauty, hula, hawaiian ‘olelo and her chanting of Pale Hua. 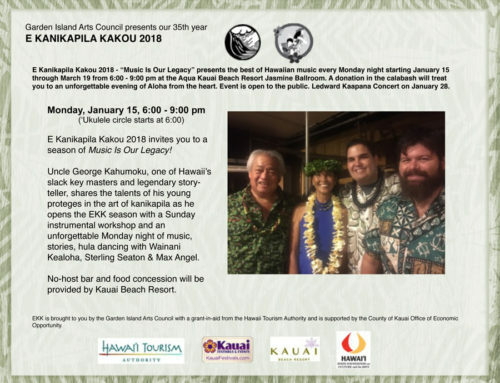 Keikilani expressed interest in recording his music while on Kaua’i, so I suggested several sound studios and he made arrangements to stay on Kaua’i longer to work with Ron Pendragon on his CD recording. When I asked if he would consider adding some visits to schools as part of my other wonderful GIAC program called Van Go! which takes art experiences to communities; he agreed enthusiastically. I scheduled him for a morning visit to Ke Kula Niihua o Kekaha and an afternoon visit to Kapa’a Middle School where Mary Lardizabal carries out a fantastic music program. I cannot thank you enough for your goodness. This was my second trip to Kaua’i…and again it was magical. It feels so much like home to me and the spirited people of Kaua’i are the most genuine I know. Our cross-island trip, on Tuesday, brought us first to the beautiful souls at Ke Kula Ni’ihau o Kekaha. We were introduced to the entire student and staff body in their state-of-the-art A/V production studio, in an up close and personal time of sharing. We shared stories and mele, and illustrated the importance of crafting emotions and sharing it with the world. Whatever your passion is, music-dance-art-poetry, use it as a vehicle to “holo mua”, move forward. Just before our departure, we were blessed by their makana and gifted a vocal performance in a capella by a trio of their students. We will always remember our friends in Kekaha. Greeted by a clear view of Ni’ihau in the distance, we took to the road again and journeyed to Kapa’a Middle School. Happy to share our stories and mele with Mary Lardizabal’s award-winning chorus class, we were even more pleased to be serenaded by them. To see young people so passionate about music has always touched me…to see them excel at it, is a truly beautiful thing to behold. We will always feel like honorary members. Mahalo to our new friends in Kapa’a, and good luck in competition. Onipa’a. Our lives will be forever changed from our adventures on Kaua’i. From the EKK concert to our spiritual rebirth at Ka pa hula o Laka, we have been blessed to find new friends and new inspirations to carry on. Mahalo Carol and mahalo to the Garden Isle Arts Council for your malama. And mahalo Kaua’i…we love you. A hui hou. Such an amazing, spiritual trip. Keoni experienced a rebirth when we visited Laka’s hula platform. And we went on to an exceptional recording session. The album is already amazing. When I met two of my favorite Ke Kula Niihau students at Leina’ala’s concert with Kuana Torres, I asked them how they enjoyed the music and stories of the Lindsey’s and Atkinson’s. Austin glowed with praise with his colorful vocabulary and Kalani whipped out his I-phone and promptly shared his photos taken the day of the visit. They gave me a blow-by-blow description of the morning. I believe they loved it….especially Keikilani’s Wolverine-like side burns. Callers asking about EKK often want to know exactly what they will get at E Kanikapila Kakou; my usual answer is “expect the unexpected” because I never know what any artist will present, and that is the excitement and beauty of our weekly EKK Mondays. I really believe that it is this unknown element that has kept EKK fresh and exciting for thirty years. The evening with Lindsay Keikilani Lindsey Jr. and his son Lindsay Leopold Lindsey III was exactly that. Blessed with a clear pure voice that borders on falsetto, Keikilani shared their own songs such as Mahana and Pua Alo written in collaboration with Kumu Keoni Atkinson who has that soulful story-telling voice that translated the Hawaiian into English. Moved by the whole experience of sharing with such a large and appreciative audience, Keoni was constantly wiping his tears away. So in tune with hula is his body that even as he spoke his hands were in motion and he swayed sensuously. During one song he even played his “air ‘ukulele” instead of dancing. His lovely daughter Lilinoe, stunning in red with giant flowers bursting out of her coif, greeted the audience with her fluent ‘olelo, talking about her early education as a student in a Hawaiian charter school. She dances beautifully, but when she began to chant-sing the words to the Pale Hua so the brave souls taught by Keoni could dance for the audience, it was really a chicken skin experience. Young Leo with his alabaster complexion and the face of an angel looks like a growing boy who has not reached his full physical stature but will be a little giant when he does. He showed up with his many electrical guitars lined up for different songs and even the sound of singing whales. His young friend from Maui, Logan Anderson, showed up with an entire drum set which actually enhanced the spiritual music without the usual overpowering percussion. For one of the songs Leo took over the drum set to show his first love in music; he’s come a long way since he demolished his first drum set at age six. Rounding out the musical team was our own Jonah Cummings on bass; it always amazes me when musicians show up with little or no rehearsal and can just strike up the music with the rest of the gang. They sang well-known Hawaiian numbers such as Hanohano Hanalei, Hi’ilawe and Kohala, but the delivery was really quite different from what one would hear at a Hawaiian backyard jam. So packed was their line-up of songs that Keikilani said he would forego the usual intermission and powered through for his full two hours. But he made sure that the ‘ukulele circle could go up and share Akaka Falls by Aunty Helen Lindsey Parker who also penned Mauna Loa. The stories enriched the understanding of the songs — about the colors of rainbow in Pua Alo or hibiscus, about the rains that wrap around the island in Kohala, about Aunty Helen’s image that appears in Akaka Falls, about the chief who fell in love with one of the lower wives of another chief and took her to Molokai, and about lovers who met in their dreams and listen to the sweet singing shells of Waipio Valley. Too soon the magical evening comes to an end but the experience lives on.